I have been trying to make more of an effort to have seasonal changes in the house, to change the daily objects of our gaze in keeping with what is happening outside. The temptation is to call it decorating, but I don't want to use that word because the small changes I am talking about come not so much from a desire to celebrate any particular holidays (although that's there, of course), but from a more deep-seated need for a connection to the passage of time. Barring the opening and closing of windows, our apartment stays the same through the seasons. Summer brings with it only air conditioning. Winter does not frost our windows, and however copious the snowfall, it never blows in when we open the door. Flowers can be had year-round, and even though the box of vegetables from the farmer tends to be full of mostly tubers by the middle of winter, the grocery store fills in. And yet, time should be marked. Occasions should be noted and celebrated. Days should not flow one into another without pause, alteration, memorable incident. So this is one small thing to help with that. It is autumn. We have pumpkins - real, painted, kid-made, (perhaps even carved, if I can remember to buy a small carving set). Yesterday I found some bright red fallen leaves to spread on the dinner table like a runner. 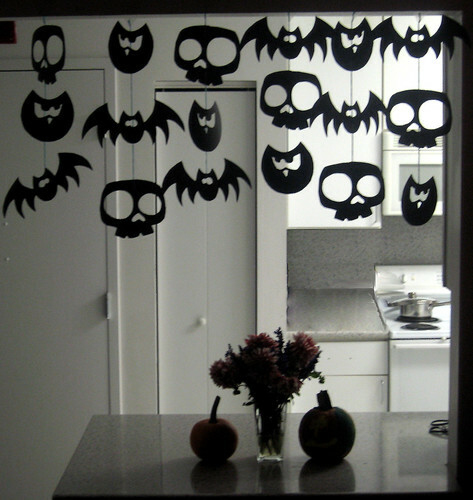 And now we have a Halloween garland hanging over the kitchen island. Three blown-up clip art images, some poster board, yarn, and tape. Makes me feel the fall. love this - am so going to do similar in my kitchen pass-through window - thanks!! And yes, seasons need to be seen, not just floated through! found you via crafty crow. love the garland! I love the garland! I, too, miss the changing of the seasons and feel a need to create a version of it in my home. Sweet words. I have this clip art a love it but had no idea how to make it super cute. But you sure did! I found your site through the Crafty Crow. This garland is great. I like how it fills the space with cuteness! Would you share the source where you found/bought the clipart? in traditional Japanese culture, the art on the walls of a home is changed with the seasons... never thought much about that until I read your post here. food for thought - thank you! I will make some small changes now, too, and see how it feels. I love the simplicity of this garland. Thanks for sharing. Thank you for the idea and the link! Wow! We love your tutorial on the Garland! I’m writing from bulbinblue.com, a new, non-profit website for creative ideas and crafts. We’d love to feature your tutorial (text and pictures too) in our upcoming Halloween section. If you are interested, please e-mail us at the address given! We would be delighted about a response! Love this idea...I am having a halloween party this weekend and this would be so simple for me to make and quick.